Positioned near the shore of Lake Michigan, the Lincoln Park Conservatory (1.2 ha / 3 acres) is a conservatory and botanical garden in Lincoln Park in Chicago, Illinois. The conservatory is situated at 2391 North Stockton Drive just south of Fullerton Avenue, west of Lake Shore Drive, and part of the Lincoln Park, Chicago community area. The Alfred Caldwell Lily Pool and the North Pond Nature Sanctuary are further to the north along Stockton Drive. Along with the Garfield Park Conservatory on Chicago's west side, it provides significant horticultural collections, educational programs and community outreach efforts. The Lincoln Park Commission established a greenhouse at the Lincoln Park site in 1877 and planted an adjacent formal garden in 1880. With the Industrial Revolution, architects in both the U.S. and Europe began to use glass and iron in construction. Nationally renowned architect Joseph Lyman Silsbee designed the Victorian conservatory in collaboration with another Chicago architect, Mifflin E. Bell. They created a glass building that would support "a luxuriant tropical growth, blending the whole into a natural grouping of Nature's loveliest forms." Silsbee gave the conservatory an exotic form by creating a series of trusses in the shape of ogee arches. Here's the our members favorite photos of "Gardens in Chicago". 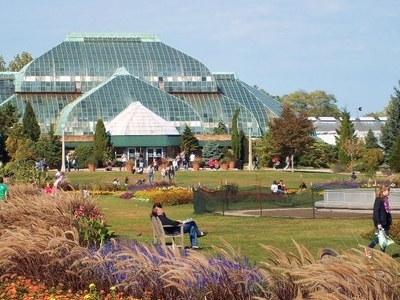 Upload your photo of Lincoln Park Conservatory!